The testo 420 is a game changer for facility management. With a seemingly never-ending daily to-do list, any tool that can streamline a routine process can have a significant impact on a facility manager's productivity. From public buildings to industrial warehouses and even laboratories, maintaining HVAC can prove challenging. The testo 420 air flow hood aims to simplify the process with its quick and easy set-up without compromising on accurate readings. 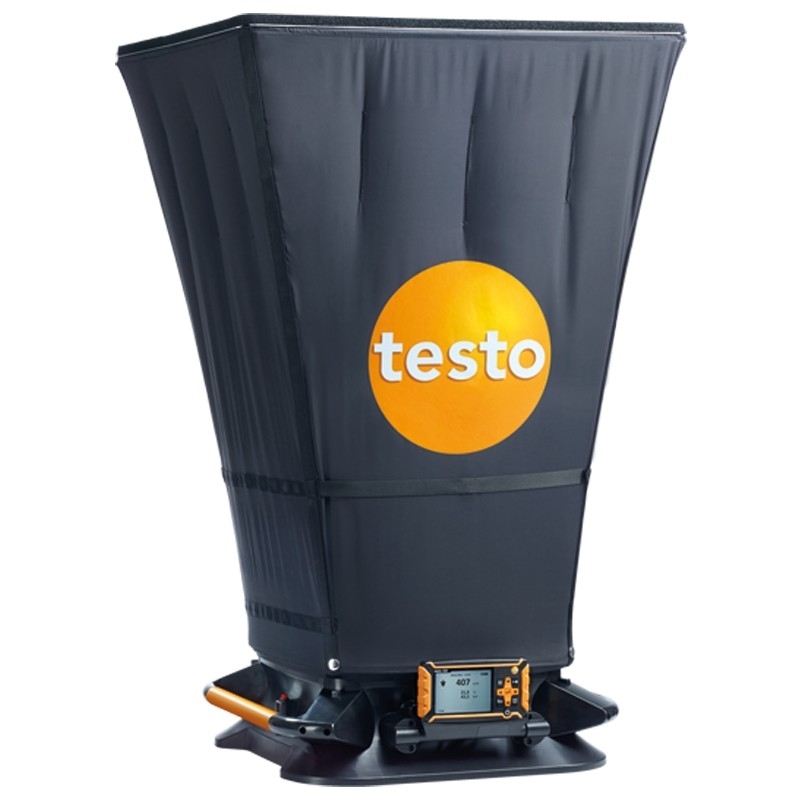 The testo 420 was primarily created for a variety of HVAC volume flow testing procedures. This includes monitoring indoor air quality, ensuring compliant work conditions and maintaining system durability through regular air flow and exchange rate measurements. The testo 420 air flow hood is ideal for regular facility maintenance. Building operations blueprints are going digital and manual data entry methods are being streamlined; it makes sense that the tools involved are getting an upgrade as well. That's why the testo 420 is equipped with a large digital display that provides fast and accurate readings, which are measured through a combination of a 16-point differential cross and static pressure. The analysis can be simultaneously created through the testo 420 application on-site, giving facility managers the added benefit of not having to interrupt their day. They simply take the readings and plug the device into a PC later on to bring up the measurements. It has an internal storage memory of up to 2 gigabytes. The hallmark of a truly valuable tool is the flexibility it provides; if you can use it in more than one way, there's less equipment you have to carry. While the main purpose of the testo 420 is to analyse volume flows specifically at large outlets, removing the measurement instrument allows it to tackle other tasks. 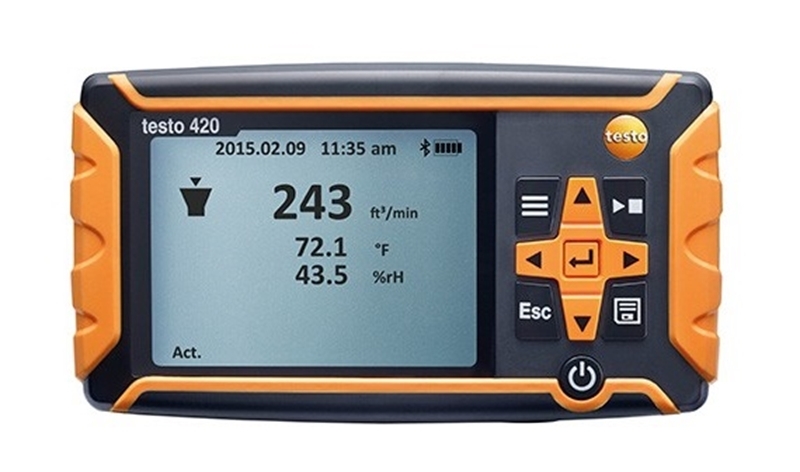 The real value of the testo 420 lies in its ability to fulfil multiple roles. Facility managers can test, for instance, volume flow within a duct by attaching a Pitot tube to the digital tool. This allows for a timed, multi-point or timed/multi-point measurement of the volume flow. Another use for the testo 420 is the simplified routine maintenance of filters in HVAC systems. Technicians can analyse pressure difference before and after the filter in a duct to accurately determine whether there may be any contamination. This saves time from having to remove and replace it and encourages regular monitoring. Facility manager is going digital, and tools like the testo 420 air flow hood are leading the way. Equipped with an intuitive interface that provides accurate readings at the click of a button, it's simply a matter of time until manual methods are phased out. Contact a Testo representative today to learn more.